The definitive industry registry of one-off and volume bike builders worldwide. 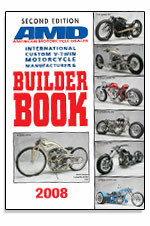 The second edition (to be published December 2007) of the AMD Builder Book will contain details of over 1000 companies producing ground-up custom motorcycles. Details include production numbers, dealer/franchise programs, parts/components programs, websites (with screenshots in expanded listings), company logos, bike shots and notes on the builders' specialties. The AMD Builder Book will be mailed free to all AMD readers (over 8,500 of whom are in the United States). As an advertising opportunity, the AMD Builder Book represents a major new way of generating high value sales leads. Builders can double-size and enhance their listing, and advertise their program as being available to dealers as a custom franchise opportunity. Parts and accessory manufacturers and distributors can promote their program to the largest guaranteed custom V-Twin audience available, which includes the highest spending buyers in the industry. The AMD Builder Book is POWERFUL! To double-size your listing costs $395 and expands your description to 90 words, and gives you 2 extra shots - website, bike or premises.